Public libraries are a popular venue for makerspaces and maker activities, but many libraries may have concerns about budget, space, and lack of staff expertise. Developing partnerships with local makerspaces and maker organizations can often help a library offer these services to patrons successfully. What can a library expect when partnering with a local makerspace, however? How does the partnership work and how can your library get one started? Why might a public library even want to bring in maker activities, and what can the benefits be? MakerBridge: Can you describe your former position at the Ann Arbor District Library (AADL) and how you first became involved with All Hands Active (AHA)? While at the Ann Arbor District Library, I worked as a Public Library Associate. The position was designed for a person attending library school–either at University of Michigan or at Wayne State–to get lots of practical experience in a range of capacities at the public library. For me, these capacities included story time, teaching computer classes, working reference and information service desks, and a number of other projects and assignments. I gravitated towards working directly with people, and especially partnering with outside groups for programming. During my time, I worked with the Washtenaw County Juvenile Detention Center, the county’s Library for the Blind and Physically Disabled, adult English Language Learners, the UM Museum of Natural History, and other groups in lots of different roles. The AADL and my supervisors were great about providing me with opportunities to learn new skills, partner with people in different departments, and create new programming if it fit in with the rest of my job and what the library wanted to do. 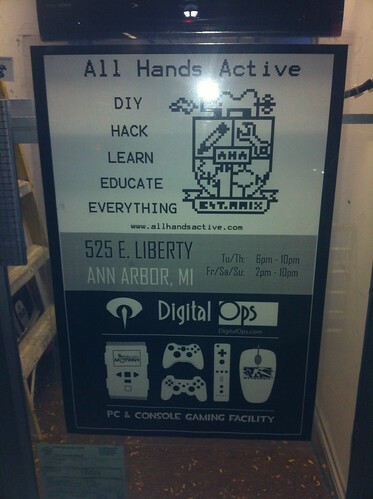 My most sustained partnership was with Ann Arbor’s hacker/maker space All Hands Active. I first heard about All Hands Active in a course on Transformative Teaching and Learning with Technology while doing research on organizations that worked with youth in after-school programs. AHA sits in a subterranean space and has the feel of a hands-on, technology-focused clubhouse, except there was always very focused work going on. Josh Williams, the shop-manager and education director at AHA, was incredibly welcoming and answered all of the questions I had, and we started working together to plan activities for the public and interview people for our TinkerHub webcast series. It went well at first, and from there it just made sense to try and keep it going. Why did AADL decide to partner with AHA? Why did AADL choose this path rather than creating its own makerspace? Well, I can’t directly speak to the AADL’s decision making, but the All Hands Active partnership seemed to fit in with some STEM-initiatives that were taking place at the library while also hitting a different age and interest group than you might readily associate with your local public library. In this situation, I gravitated towards working with people doing really cool, community-minded work while seeking to develop skill sets that fit the community’s needs. So, the excitement and the specific people involved brought me in, rather than the idea of makerspaces—I don’t think I knew what that word meant at the time. 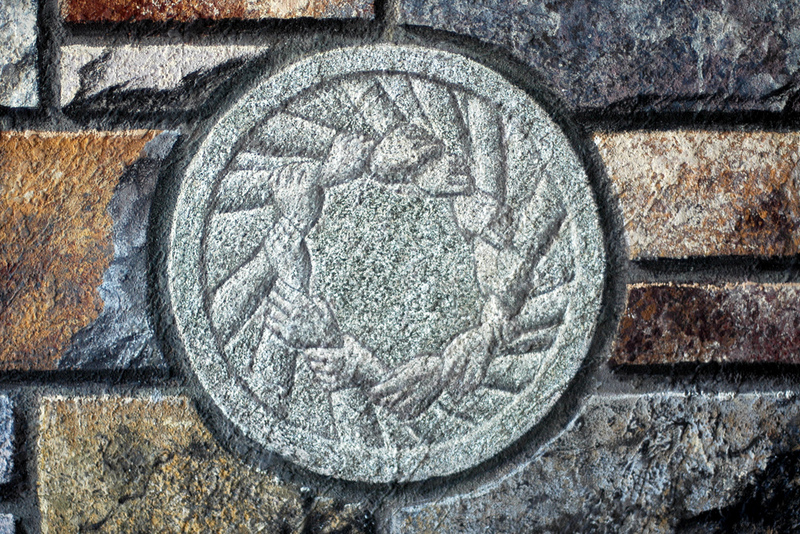 Our collaboration was a result of encountering the right type of organization to partner with right when it fit a direct need of the library and the community. All Hands also does regular school outreach, might be the first makerspace to have a summer camp, and genuinely cares about making active technology use more accessible to a broader audience. They also benefit from Ann Arbor generally having a wealth of technology-minded intelligence, and the AADL in turn was able to help their patrons benefit from that. If your community has a bunch of smart people focused on making newly developing technologies viable for new audiences, then I think it makes sense to bring them into the library. It also helped to raise AHA’s profile in the community at the same time. We’ve been able to bring out people who weren’t coming to the library to these programs, who also hadn’t heard of All Hands Active. The coolness of the technology itself is a big draw. What is the audience for your maker activities? One of the things we noticed was that these activities pulled in people that might not otherwise be coming to the library. We had whole families working together on projects, like Line-Following Robots, and you had dads coming up afterward to me and Josh to tell us that they were always looking for activities where they could connect with their kids, and that these kinds of workshops provided an opportunity for that. In general, I have found that the people that are attracted to these activities have been a little bit interested in novelty, a little bit interested in technology, and often interested in some other entry point, like design for the 3-D Printing or robotics for Arduino and the Line-Following robots. For the 3D Printing workshop, a lot of the people were very interested in creating 3-Dimensional designs in the computer program, in and of itself they found that to be satisfying, and the possibility of turning it into a real object was a bonus. One of the reasons that these activities have an opportunity to work well and attract a variety of people is that they do have many different possible entry points, aspects to get excited about. What are some of the best activities you have carried out successfully? “3D Printing” has consistently worked out well, and the library continues holding additional workshops and getting different patrons in attendance. “Computer programming basics for creating puzzles and games,” which was really about teaching folks about the basics of computer logic and having them try out challenges working within the confines of computer programming. That went very well. We had industry experts making foundational computer-programming knowledge free and accessible to the public in a responsive learning environment—the sort of thing that doesn’t happen almost anywhere else except for at places like the AADL. “Atari Punk Circuit” was awesome, maybe my favorite, and a great example of kids working alongside their parents on a technical challenge. We had a few others that went well, too: “Arduino Basics,” “Line-Following Robots.” And I am certain that they are currently cooking up a whole new round of cool activities—I recently got a message from Josh saying that they’re planned through the next four months. At first, I just wanted to interview Josh, because I thought presenting information about All Hands Active to the public would be a benefit. People should know about cool activities happening in their community, and AHA definitely fit. The interview went very well, so we started thinking of other people that were in the Ann Arbor area and getting involved in connecting the public to technology. What do you think are the most important lessons you have learned through working on this partnership? 1. Having resourceful, energetic partners with incredible knowledge helps make amazing things happen in a library. They might not be self-described “Makers” in your community, but they’re out there somewhere. One of our interviewees told us that the most important thing for a new makerspace is that one person that has the connections and the charisma to make things go, and I think the same is true for forming a successful library-community partnership. 2. With these sorts of workshops, prepare, prepare, prepare. This means having conversations with your superiors, associated departments, and people that will be working around the event as soon as possible. It also means running through the activities when you can. I found practicing the construction of the activities very helpful even though I wasn’t always directly leading the program: I learned a lot and helped search out the possible areas for misunderstanding–even if my Atari Punk Circuit didn’t work too well at first. 3. Since some of these ideas are new and strange to people, and curiosity isn’t always going to motivate people enough to actually set aside time, figure out ways to present it to the public in different ways. There might be teachers in the area excited about these topics, or mailing lists that you can send it out to, or even an opportunity to put something like a 3D Printer out on an information desk leading up to the program. Many thanks to Terence, and be sure to check out all the links for more information! Have questions or want to know more? Leave your thoughts in the comments on this post or in MakerBridge’s forums!